Let the sweet melody of our wellness centre and the waves of our pool rock you gently while you enjoy the wonderful view of the mountains. A dream come true! The indoor heated pool and the breathtaking view will make you want to dive into the water before relaxing in the 33 °C whirlpool. What better way to charge your batteries while admiring the wonderful view of the mountains and the surroundings. Water, slides, and water games are the answer to every child’s dreams. A wonderful world of fun and happiness is waiting for them. A colourful swirling water slide in the children’s area and water jets of all sorts will ensure a fun and cheerful experience for your little ones. Discover your personal oasis. Take a break and immerse yourself in the wonderful world of wellness. After an intense day full of outdoor activities, what’s better than enjoying the relaxing and purifying warmth of a sauna? Breathe in the regenerating vapours and essences of a Turkish bath and feel their immediate beneficial action on your body and soul. 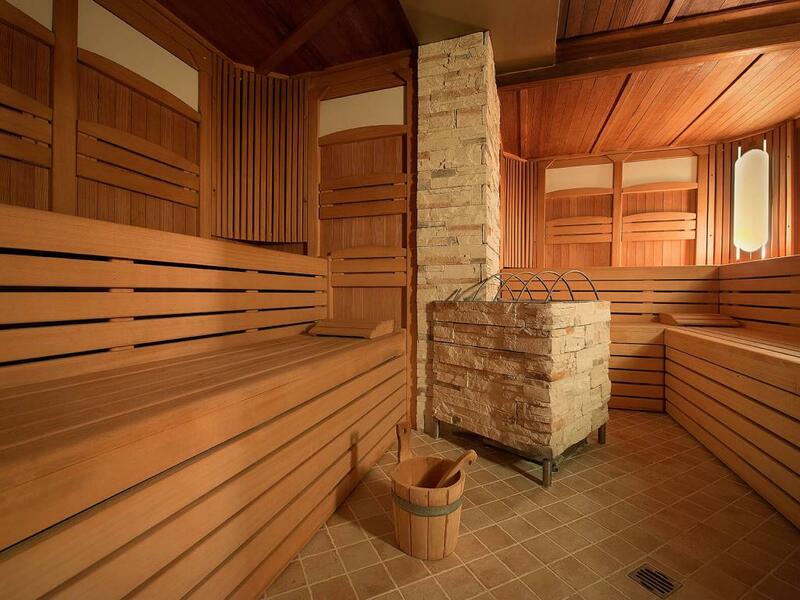 Cool down in the ice cave or take an emotional shower with chromotherapy. Take your time in the phlebological path and enjoy a pleasant sense of lightness in your legs. Take advantage of the benefits of halotherapy for your skin, respiratory system, and against stress with a session in the salt room completely covered in pink Himalayan salt. For a relaxing holiday, you won’t forget. Enjoy a moment of tranquillity, harmony, and peace of mind. You will slowly forget your busy everyday life immersed in a relaxing atmosphere. 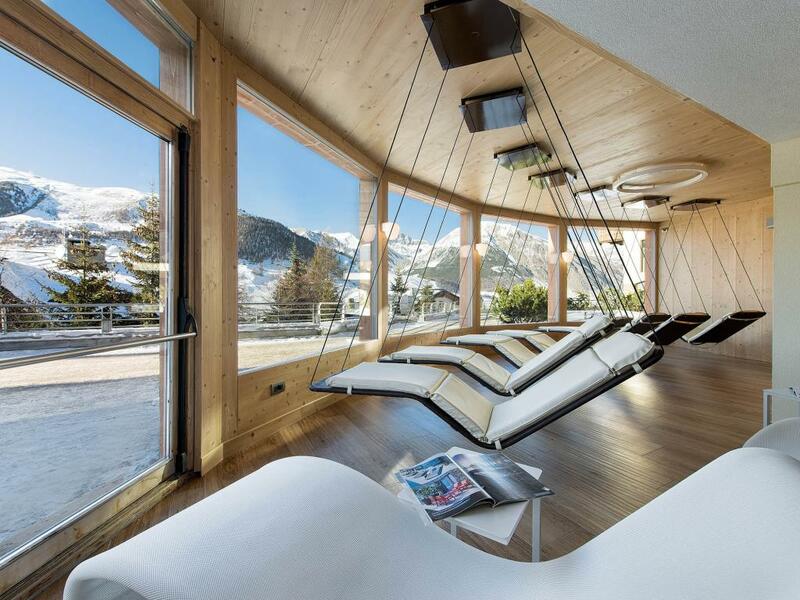 Rocking on a suspended chair and kissed by the sun, you will soon forget about the passing of time in a peaceful, relaxing atmosphere and enjoying a wonderful view of the Alpes. 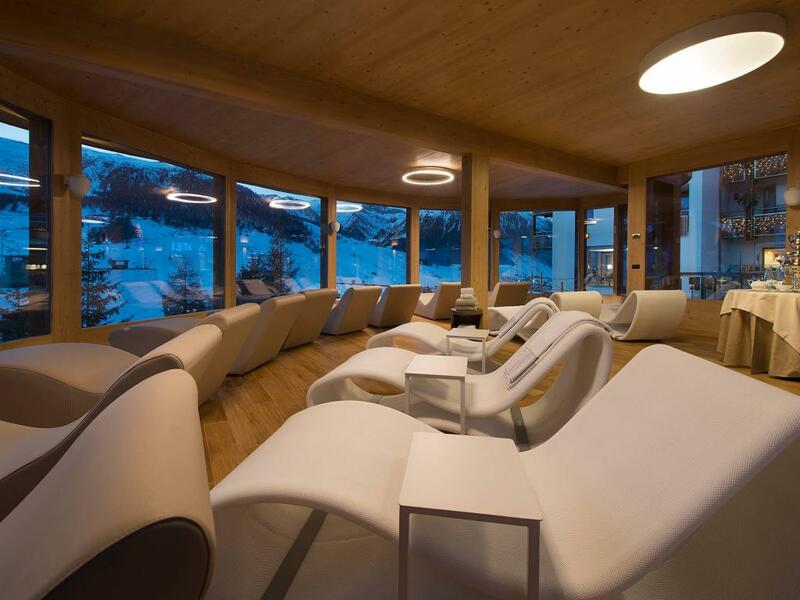 A relaxing environment surrounded by an incredible view of the mountains. This is where your body and mind will find new energy, and you will find your peace of mind. Come and relax in a comfortable chair surrounded by light wood hues and in a peaceful atmosphere. Your gaze will travel to the mountain slopes and you will start daydreaming in no time. 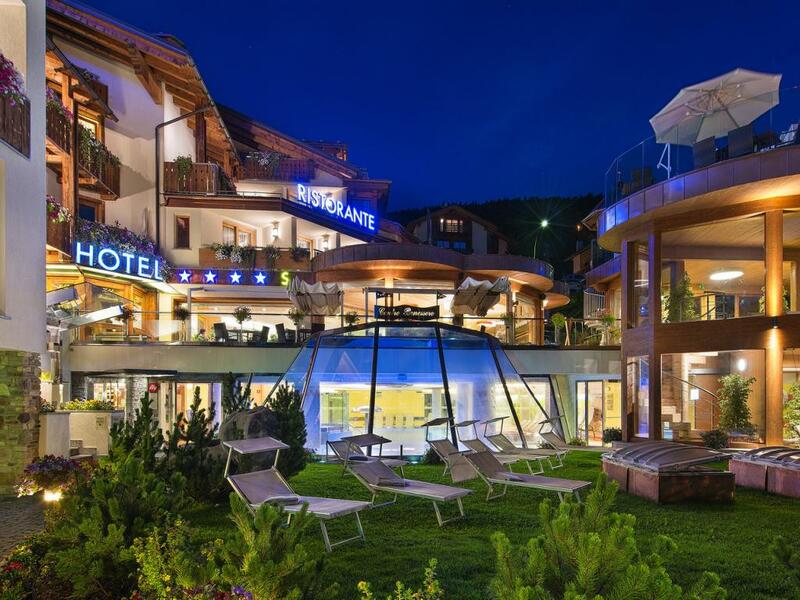 A breathtaking natural stage overlooking the splendid Livigno Valley. You’ll remain awe-struck by the beauty of nature and the sensation of infinity you’ll feel. In summer, it’s the perfect place to relax and let the mountain breeze caress you under the bright blue sunny sky. A place where to take a break and enjoy refreshments without interrupting your relaxation. 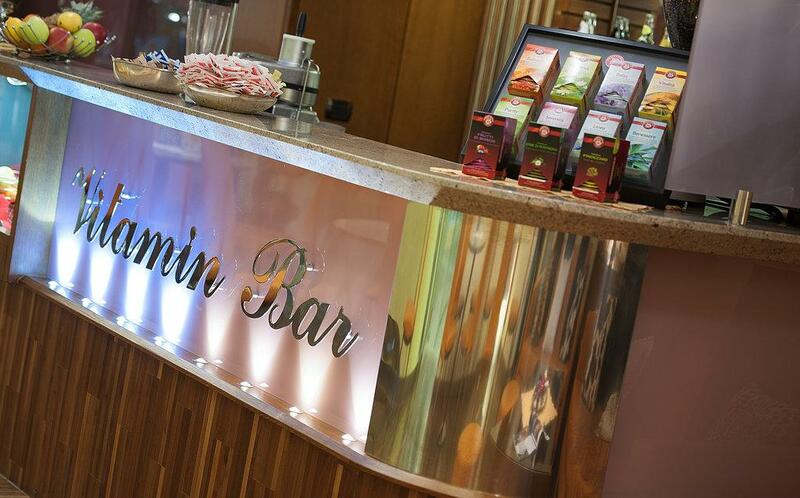 The Vitamin Bar inside the wellness centre provides the right atmosphere to relax and regain your strength enjoying juices, fresh smoothies, and thirst-quenching drinks. Who said you have to give up your training and fitness schedule when on holiday? Our gym with all its state-of-the-art equipment is here for you. 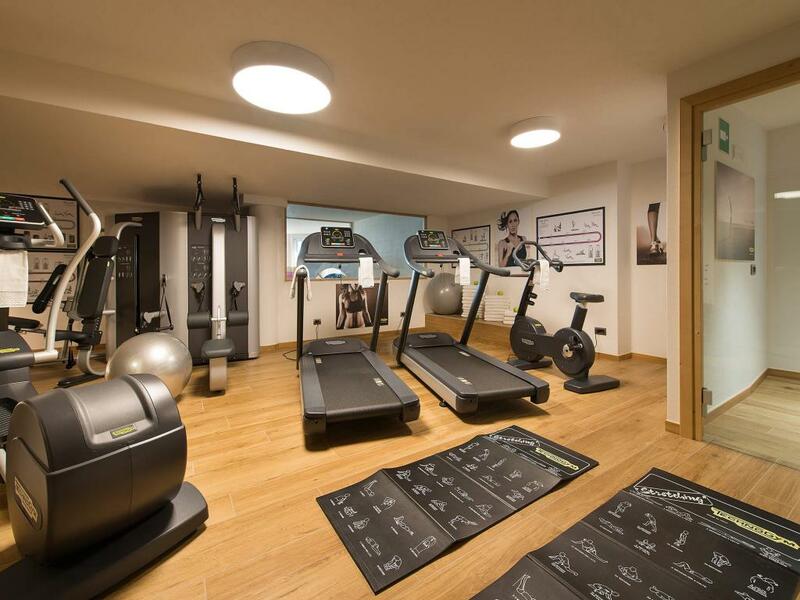 You can use any of our Technogym equipment for a wide range of exercises that meet any requirement.